Q: So, how important is routine when it comes to learning? For example, is it important to have a dedicated study area at home? A dedicated time of day? Ben Carey: Not at all. Most people do better over time by varying their study or practice locations. The more environments in which you rehearse, the sharper and more lasting the memory of that material becomes – and less strongly linked to one “comfort zone.” That is, knowledge becomes increasingly independent of surroundings the more changes you make – taking your laptop onto the porch, to a café, on the plane. The goal, after all, is to be able to perform well in any conditions. Changing locations is not the only way to take advantage of the so-called context effect on learning, however. Altering the time of day you study also helps, as does changing how you engage the material, by reading or discussing, typing or writing by hand, sitting or standing up, studying in silence or while listening to music: each counts as a different learning “environment” in which you store the material in a different way. BC: More important than how long you study is how you distribute the study time you have. Breaking up study time – dividing it into two or three sessions, instead of one – is far more effective than concentrating it. If you’ve allotted two hours total to mastering some Spanish vocabulary, for example, you’ll remember more if you do an hour today and an hour tomorrow, or – even better – an hour today and an hour two days from now. That split forces you to re-engage the material, dig up what you already know, and then re-store it – an active mental step that reliably improves memory. Three sessions is better still, as long as you’re giving yourself enough time to dive into the material or the skills each time. BC: Not always, no. Cramming works fine as a last resort, a way to ramp up for an exam if you’re behind and have no choice. The downside is that, after the test, you won’t remember much of what you “learned” – if you remember any at all. That reason is that the brain, ironically, can sharpen a memory only after some forgetting has occurred. In this way, memory is like a muscle: a little “breakdown” allows it to subsequently build greater strength. Cramming, by definition, prevents this from happening. Q: There’s so much concern that smartphones and all manner of electronic gadgets are interfering with learning — and even changing the way people think. Is this true, though? Is distraction always bad? BC: Distraction is a hazard to learning if you’re doing something that requires continuous focus, like listening to a lecture. But a short break – say, ten minutes to scroll through your Instagram feed, respond to a few emails, check some scores – is actually the most effective technique scientists know of to help you solve a problem when you’re stuck. Distracting yourself from the task at hand allows the brain to let go of mistaken assumptions, re-examine the clues in a new way, and come back fresh. If you’re motivated to solve the problem – whether it’s a proof, an integral, or a paragraph you just can’t get right – your brain will continue to work on it during the break offline, subconsciously, without the (fixated, unproductive) guidance you’ve been giving it. Q: Why do we sometimes fail tests when we feel like we’ve tried so damned hard to prepare? BC: The illusion that you “knew” something well just because it seemed so self-evident at the time you studied it. This is what learning scientists call fluency, the presumption that because something is well known now, it will remain that way tomorrow, or a week from now. Fluency illusions form automatically and subconsciously. Beware “study aids” that can reinforce the illusion: highlighting or re-writing notes, working from a teacher’s outline, re-studying after you’ve just studied. These are mostly passive exercise, and they enrich learning… not at all. Making your memory work a little harder – by self-quizzing, for example, or spacing out study time – sharpens the imprint of what you know, and exposes fluency’s effects. BC: We now know that sleep has several stages, each of which consolidates and filters information in a different way. For instance, studies show that “deep sleep,” which is concentrated in the first half of the night, is most valuable for retaining hard facts – names, dates, formulas, concepts. If you’re preparing for a test that’s heavy on retention (foreign vocabulary, names and dates, chemical structures), it’s better to hit the sack at your usual time, get that full dose of deep sleep, and roll out of bed early for a quick review. But the stages of sleep that help consolidate motor skills and creative thinking – whether in math, science, or writing – occur in the morning hours, before waking. If it’s a music recital or athletic competition you’re preparing for, or a test that demands creative thinking, you might consider staying up a little later than usual and sleeping in. Exhaustion is the brain’s way of telling us that it’s time to stop. There’s little percentage in continued bleary-eyed staring at the social studies workbook or sawing away at the cello. The time has come to hit the hay — and let the sleeping brain finish the job. Q: There’s a phrase you use in the book – to maximize our learning potential, you urge us to “free the inner slacker.” You suggest we should be less rigid about our studying. Recognize the brain is learning in all these other, more expansive ways, ways that may not conform to what we’ve been lead to believe about proper study habits. Is this a learning strategy? BC: If it means drinking beer in front of the TV, then no. 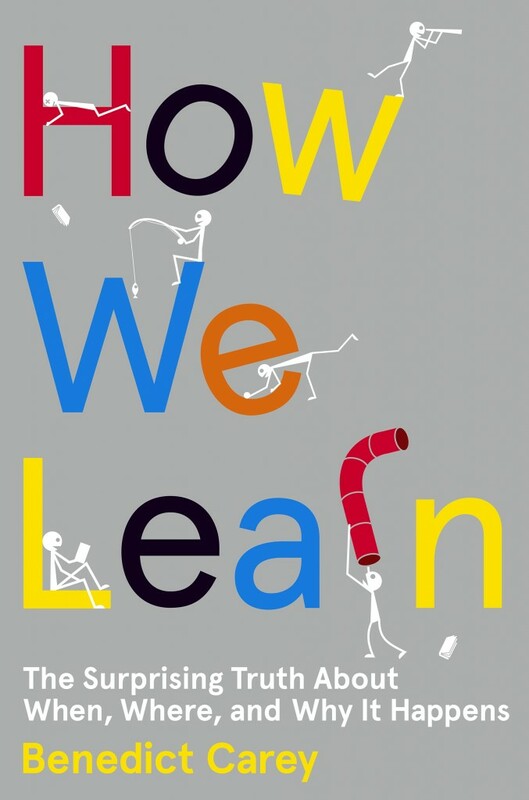 But to the extent that it means appreciating learning as a restless, piecemeal, subconscious and somewhat sneaky process that occurs all the time – not just when you’re at school, or sitting in a desk, faced pressed into a book – then it’s the best strategy there is. And it’s the only one available that doesn’t require more time and effort on your part, that doesn’t increase the pressure to achieve. So interesting! I’m an experienced (“old”) learner, and it’s great to come across some new ideas about how to be a effective learner–something that I strive to continue. I know its not the point, but I am thrilled that people are still reading The Westing Game. That was one of my absolute favorites when I was Phoebe’s age. Looking forward to the next book edited by Andy Ward! Thanks for the hit of Calvin and Hobbes. I’m passing this post on to my daughter: she’s just started studying for A Levels and will find these tips invaluable as the pressure increases. I love that he regards learning as “a restless, piecemeal, subconscious and somewhat sneaky process that occurs all the time”! I saw a post about this on NYTimes recently, and my husband is picking the book up from the library this afternoon. He’s a sucker for re-writing his notes and despite my claims otherwise, swore by it…until he bombed his first grad school test! I really enjoyed reading this article and will share these tips with my kids! Thank you!